SONOMA, Calif. - Pole sitter Chase Elliott completed a daring pass of race leader Noah Gragson with three laps remaining to claim the NASCAR K&N Pro Series West Chevys Fresh Mex 200 Saturday afternoon at California’s famed Sonoma Raceway. Elliott had saved his tires throughout much of the race before he made his race-winning win with three laps to go to overtake Gragson, who was selected to the latest NASCAR Next class earlier this year. Gragson had led a race-high 34 laps before losing the lead to Elliott. Gragson said he learned a great deal racing against someone the caliber of Elliott, a leading NASCAR Sprint Cup Series Sunoco Rookie of the Year candidate. Elliott said he hoped to apply the track time he was able to obtain today to Sunday’s Toyota/Save Mart 350. Gracin Raz turned in a strong performance, leading three times for 10 laps, to finish third. While Ryan Partridge and Riley Herbst finished fourth and fifth, respectively. Michael Shawhan, Tom Klauer, Scott Ivie, Carlos Vieira and Cole Rouse rounded out the top 10. The race experienced a slow start, as there was a multi-car pileup when the Green Flag dropped that sent four cars to the garage. Two of those cars included K&N Pro Series West championship contenders and Bill McAnally Racing teammates, Todd Gilliland and Chris Eggleston. Once the race got underway, the drivers got a better feel for the track and settled in to put on an exciting show for the fans. The Chevys Fresh Mex 200 will air on NBCSN Thursday, June 30 at 11 p.m. ET/8 p.m. PT. 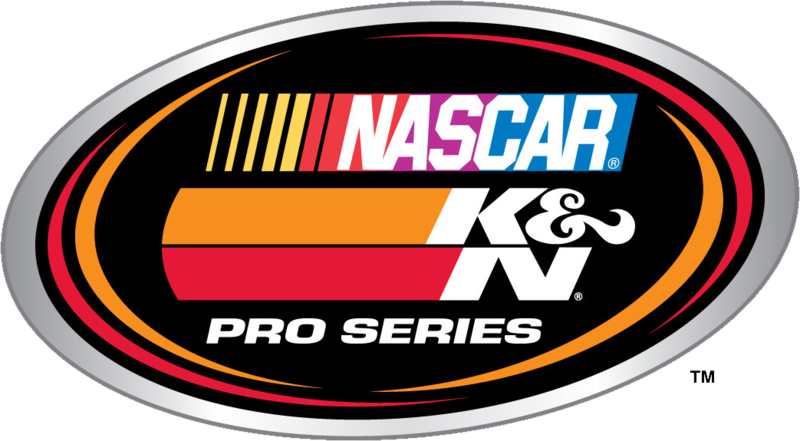 The NASCAR K&N Pro Series West will be back in action at Idaho’s Stateline Speedway for the Toyota/NAPA Auto Parts 150 on Saturday, July 9. 1. (1) Chase Elliott, Dawsonville, GA, Chevrolet, 64 laps, 64.732 mph. 2. (4) Noah Gragson, Las Vegas, NV, Ford, 64. 3. (7) Gracin Raz, Lake Oswego, Ore., Ford, 64. 4. (2) Ryan Partridge, Rancho Cucamonga, Calif., Ford, 64. 5. (10) Riley Herbst, Las Vegas, Nev., Toyota, 64. 6. (17) Michael Shawhan, Los Gatos, Calif., Chevrolet, 64. 7. (23) Tom Klauer, Reno, Nev., Chevrolet, 64. 8. (20) Scott Ivie, Mountain View, Calif., Toyota, 64. 9. (22) Carlos Vieira, Atwater, Calif., Chevrolet, 64. 10. (8) Cole Rouse, Fort Smith, Ark., Ford, 64. 11. (6) Julia Landauer, New York, N.Y., Toyota, 64. 12. (21) Tim Spurgeon, Danville, CA, Chevrolet, 64. 13. (26) Takuma Koga, Nagoya, Japan, Chevrolet, 64. 14. (24) Matt Levin, Tucson, Ariz., Ford, 64. 15. (27) Jesse Iwuji, Dallas, Texas, Toyota, 63. 16. (15) Todd Souza, Watsonville, Calif., Toyota, 63. 17. (9) Will Rodgers, Murrieta, Calif., Chevrolet, 62. 18. (29) Rodd Kneeland, Sonoma, Calif., Chevrolet, 62. 19. (16) James Bruncati, Glendora, Calif., Ford, 58, accident. 20. (30) Jack Sellers, Sacramento, CA, Chevrolet, 50, accident. 21. (19) Blaine Perkins, Bakersfield, Calif., Chevrolet, 50. 22. (25) Ron Norman, Tucson, Ariz., Ford, 45, suspension. 23. (14) Brian Wong, Newport Beach, Calif., Chevrolet, 44, accident. 24. (5) Todd Gilliland, Sherrils Ford, N.C., Toyota, 41. 25. (13) Alex Schutte, Redding, Calif., Ford, 38, suspension. 26. (11) Chris Eggleston, Erie, Colo., Toyota, 34. 27. (31) Rich DeLong III, Santa Clarita, Calif., Chevrolet, 2, suspension. 28. (28) Stafford Smith, Eagle, Idaho., Chevrolet, 1, engine. 29. (18) Johnny Borneman, Ramona, CA, Ford, 0, accident. 30. (3) David Mayhew, Atascadero, CA, Chevrolet, 0, electrical. 31. (12) Jim Inglebright, Fairfield, Calif., Chevrolet, 0, did not start. Lead Changes: 10 among 4 drivers. 18-25; N. Gragson 26-33; G. Raz 34; N. Gragson 35-41; G. Raz 42; N. Gragson 43-61; C.
Standings: 1. R. Partridge, 256; 2. T. Gilliland, 241; 3. C. Eggleston, 235; 4. N. Gragson, 231; 5. G. Raz, 222; 6. J. Landauer, 219; 7. C. Rouse, 215; 8. R. Herbst, 213; 9. R. Norman, 194; 10. M. Levin, 193. SACRAMENTO, CALIFORNIA (June 23, 2016) - The Pacific Challenge Series presented by PenneyLawyers.com makes its national television debut tonight on MAVTV, with coverage of the March 19th race from LoanMart Madera Speedway. The 75 lap PCS race will partner with the second race from the Jr. Late Model Series for a one hour broadcast at 8 p.m. Eastern / 5 p.m. Pacific Time. Madera Speedway is billed as "the fastest one-third mile in the West" and this event saw eight drivers break the track record in qualifying. Both the March and August races at Madera will be televised under the "Madera Racing" banner. The Jr. Late Model Series is the world's first series for drivers ages 10-16 racing in full size Late Model stock cars. Thursday's broadcast is part of a busy ten day summer stretch for the PCS with some of its most significant moments of the 2016 season. On Friday, teams will head to Roseville's All American Speedway in preparation for Saturday's 100 lap race during the Placer County Fair. The following weekend, the PCS heads to Stockton 99 Speedway with Friday practice and the "Firecracker 100" for $4000 to win on Saturday July 2nd. DAYTONA BEACH, Fla. (June 22, 2016) – The NASCAR K&N Pro Series West will head to their first of three road courses of the season this weekend at California’s esteemed Sonoma Raceway. Below is a look at the past performance of the series and selected drivers. • Todd Gilliland heads into the weekend four points ahead of Chris Eggleston, who is coming off a win at Colorado National Speedway, and six points over Ryan Partridge. • Noah Gragson trails in fourth and celebrated a victory in the NASCAR K&N Pro Series East last weekend at Stafford (Conn.) Motor Speedway. • David Mayhew, the defending race winner, will be making his second start of the season this weekend at the 1.99-mile road course. • Sonoma has hosted two series races in 1978. In addition, the series participated in nine combination events with the NASCAR Sprint Cup Series at the Northern California road course between 1989 and 1997. • The Sonoma track, located near the intersection of Highways 37 & 121, opened as Sears Point Raceway om 1968, with its inaugural event occurring on December 1, 1968. The road course was initially a 2.52-mile layout, but reconfigurations in 1998 and 2001 resulted in the current 1.99-mile design for NASCAR events. • The track features more than 160 feet of elevation change from its highest to lowest points. The highest point at Turn 3a reaches 174 feet, while the lowest point at Turn 10 is just 14 feet. • Seventeen different drivers have visited Victory Lane in series action at Sonoma. Hershel McGriff (1983, 1985 and 1987), Jim Insolo (1978, 1979 and 1980) and Bill Schmitt (1981, 1988 and 1989) – lead the list of winners, with three wins each. • Other multiple victors at the historic road course include Butch Gilliland, who scored back-to-back win in 1996 and 1997, and his son, David Gilliland, who notched victories in 2007 and 2012, Jason Bowles made consecutive trips to the winner’s circle in 2008 and 2009. • Of the 16 drivers who have won series events at Sonoma, 12 won NASCAR championships. Ten of those were NASCAR K&N Pro Series titles. • NASCAR Sprint Cup Series drivers have won three of the past five competitions at Sonoma – Joey Logano in 2011, David Gilliland in 2012 and Kyle Larson in 2014. Chase Elliott is the sole NASCAR Sprint Cup driver slated to compete in the Chevys Fresh Mex 200. • David Mayhew is the only previous race winner scheduled to compete with the series this weekend. • Nineteen drivers have qualified on the pole. McGriff leads with three poles at Sonoma – Butch Gilliland, Jim Bown, Roy Smith and Tim Williamson each have two poles at the road course. • Eight of the 26 series races were won from the pole position and seven were won by the driver who started second on the grid. Insolo came from the furthest back, charging from 19th to win in 1978. • Last season’s race had three cautions for 13 laps. 1-Lap Qualifying Record: Kyle Larson, Chevrolet, 77.203 seconds (92.794 mph), June 19, 2010. 64-Lap Race Record: Andrew Ranger, 1 hour 50 minutes and 30 seconds, 67.595 mph, June 19, 2010. • Heads into the weekend ranked 15th in the NASCAR K&N Pro Series West races after one top five and two top 10s in two starts. • In nine starts at Sonoma, he’s earned one top five and 3 top 10s and led a total of five laps. • Sits second in the standings, four points behind Gilliland, with two wins and five top fives. • In his Sonoma debut last season, he finished 13th after starting 17th. • Is first in the K&N Pro Series West standings with two victories and five top fives. • This will be his first series’ road course start. • Is fourth in the series standings headed into the Chevys Fresh Mex 200 with two top fives and five top 10s. • In his Sonoma debut last season, he finished seventh after starting 12th. • In the NASCAR K&N Pro Series East road course event at VIRginia International Raceway this season, he led six laps. • This will be his first K&N Pro Series West start of the season. • In 11 starts at Sonoma, he’s recorded two top fives and five top 10s. • The Chevys Fresh Mex 200 will be his 2016 K&N Pro Series West debut. • In eight starts at the California road course, his best finish is 12th in 2010. • His average start at Sonoma is 28.8, while his average finish is 23.2. • Heads into the weekend ranked fifth in the standings with two top fives and five top 10s. • This will be her first K&N Pro Series West road course start. • This will be his second K&N Pro Series West start of the season. • He won last year’s event at Sonoma after leading the last four laps. • In eight starts at Sonoma, he’s earned one win, three top fives and four top 10s and led a total of 13 laps. • Is third in the championship standings with one win, four top fives and five top 10s. • In his first start at Sonoma last year, he finished fourth after starting seventh. • Heads into the weekend ranked seventh in the standings with two top fives and three top 10s. • In his Sonoma debut last year, he finished 12th after starting 21st. • This will be his first NASCAR K&N Pro Series West start since 2012. • He will be making his Sonoma Raceway debut in both the K&N Pro Series West and NASCAR Sprint Cup Series this weekend. • In three K&N Pro Series West starts he’s collected two top fives. • The 2016 season is the 63rd for the NASAR K&N Pro Series West. • Gilliland expanded his K&N Pro Series West win streak to three after winning the second race of the season at California’s Kern County Raceway Park. It's going to be another exciting weekend for fans who love to watch tire rubber being laid down on asphalt racing surfaces. We have six opportunities for your consideration this weekend: with all of them located in California. ALL AMERICAN SPEEDWAY. 1/4 MILE. ROSEVILLE, CA. www.allamericanspeedway.com SATURDAY, JUNE 25TH. Saturday night at All American will feature a special guest appearance from the always exciting Pacific Challenge Series, presented by Pennylawyers.com, Also on the race agenda will be on track action from the Northern State Modifieds and the Pro 4 Modifieds. By they way, this racing will play a major role in the entertainment line up for the annual Placer County Fair ongoing through Sunday. All of this fun makes it a great reason to spend the weekend in beautiful Roseville, CA. For several years now the Pacific Challenge Series has been regarded as being one of the better regional touring series, for Late Model racing teams, in the western states area. It's a highly competitive series that always creates more bang for the ticket buck for the fans who turn out to watch their races. Would you like a sneak peak at this outstanding series? The Pacific Challenge Series will be making their national television debut, Thursday-June 23d at 5pm pacific time, when MAV TV airs a race, video taped by the award winning Lucas Oil Production Studios, from the Madera Speedway. The All American Speedway weekend begins on Friday with a special practice session from 3 to 8pm. Pit passes for the session, open to all scheduled divisions, are $35. Individual car fees have been waived for this event. On Saturday race day there will be the standard practice session beginning at 2pm followed by qualifying at 5pm and racing at 6pm. General admission tickets, age 16 to 59, are $10 which is a true bargain for a show of this quality. Tickets for seniors and kids age 6 to 15, are $7 with kids age 6 and under admitted free. The speedway also offers a budget friendly family pass, priced at $35,which admits two adults and three kids.There's also a small admission fee for the fair. Adult fair tickets are $5, and $3 for youth, seniors and military. Kids age 5 and under will be admitted free. IRWINDALE EVENT CENTER, (IEC). 1/2 & 1/3 MILE. IRWINDALE, CA. www.irwindalespeedway.com SATURDAY, JUNE 25TH. the Racecar Factory Spec Late Models, presented by Frank's Auto Service of Anaheim, and the Bandoleros. If you lovIRWINDALE EVENT CENTER, (IEC). 1/2 & 1/3 MILE. IRWINDALE, CA. www.irwindalespeedway.com SATURDAY, JUNE 25TH. the Racecar Factory Spec Late Models, presented by Frank's Auto Service of Anaheim, and the Bandoleros. If you love full size truck racing as much as I do then you're in luck this Saturday night because the IEC will also be featuring racing from the Seidner's Collision Centers Irwindale Race Trucks along with a special guest division appearance from the Robertson Solar Southwest Tour Trucks. The spectator gates will open at 4pm with the racing going green at 7pm. General admission tickets are $10 pre sale or $15 if purchased at the ticket gate on race day. Pre sale tickets can be obtained via online or by visiting the IEC office at 500 Speedway drive. Children's tickets are $5. KERN COUNTY RACEWAY PARK. 1/2, 1/4 & 1/8 MILE. BAKERSFIELD, CA. www.kernraceway.com SATURDAY, JUNE 25TH. It's KGET Channel 17 Night At The Races at Kern County featuring an exciting evening of NASCAR sanctioned racing. On the race agenda will be the NASCAR Super Stocks and the NASCAR Spec Mods featuring featuring an entry from Channel 17 News At Sunrise anchor Jason Gavin driving the #42 car. Adding to the on track excitement will be racing from the INEX Legends, INEX Bandoleros and, for you two wheel racing fans, round three of the Golden Empire Super Moto. The spectator gates will open at 5pm with the racing seeing the green flat at 7pm. General admission tickets are $10 with a variety of low cost reserved grandstand seating available via the speedway's website. LAKEPORT SPEEDWAY. 1/4 MILE. LAKEPORT, CA. www.lakeportspeedway.com SATURDAY. JUNE 25TH. Lakeport will be treating its fans to a full evening of fun, and old school, racing divisions his Saturday night featuring the Bandoleros, Bombers, Jalopies Jammers and Legends. The gates will open at 330pm. Qualifying will start at 5pm followed by racing from all of those fun divisions. General admission tickets are $12. Tickets seniors, age 60 plus, and students with valid ID are $9. Kid's tickets and 1st responders with valid ID are $6. Toddlers and infants will be admitted free. The speedway also offers a family pack, priced at $30, which admits two adults and three kids. ORANGE SHOW SPEEDWAY. 1/4 MILE. SAN BERNARDINO, CA. www.theorangeshowspeedway.com SATURDAY, JUNE 25TH. The historic OSS will be presenting Double Points Night this Saturday and that usually means double the racing intensity and double the racing excitement for the fans. Providing the on track excitement will be the speedway's Open Late Model, 1 800 Loam Mart Street Stock, Mini Stock, Bandolero, Barber Pole and OSS Modified divisions. The speedway will be conducting a special practice session, open to all divisions, from 830 to 1145pm, with entry fees set at $50 per car. Later in the day, there will be the standard practice session beginning at 1pm followed by qualifying ar 315pm, a practice session for Barber Pole teams at 430pm, heat races at 6pm and main events going green at 7pm. General admission tickets are $10. Kid's and seniors tickets are $8. Active duty military personnel and kids under the age of five will be admitted free. STOCKTON 99 SPEEDWAY. 1/4 MILE. STOCKTON, CA. www.stocktonspeedway.com SATURDAY & SUNDAY, JUNE 25TH & 26th. The Stockton 99 will be treating its fans to a full Saturday night race schedule featuring their Stockton Late Model, Bomber, Mini Cup, Grand American Modified and Basic 4 Cylinder divisions. The weekend begins on Friday with an open practice session from 4 to 8 pm. Pit pass entry fees are $40. On Saturday race day the spectator gates will open at 5pm followed by racing at 6pm. General admission tickets, age 16 to 59, are $15 with tickets for juniors, age 11 to 15, and seniors, age 60 plus, priced at $10. Kids age 10 and under will be admitted free. Then on Sunday, the Stockton Oval will be featuring open drifting presented by D 1 Street Legal USA who will be hosting round 2 of their Open Drifting Series. The gates will open at 2pm with the rubber burning, drive them sideways. drifting hitting the track at 3pm Spectator tickets are priced at $10. The second outlaw kart event of the 2016 season at Redwood Acres Raceway took place this past Saturday night. It was Humboldt Performance and NorCal Automotive Night at the Races as drivers took to the .110-mile dirt oval. Taylor Fuller was fast time in the beginner box stock division setting a 10.671. Fuller took the trophy dash win while T.J. Sorrels was the heat race winner. Jacob Boldway led the first two laps of the 20 lap main before Sorrels took over. Fuller looked to have the setup right on his kart and on lap nine Fuller took the lead. Fuller looked to have the victory in hand until getting tangled with slower traffic with three laps remaining. Sorrels regained the race lead and was able to hold on the remaining few laps for the win. Fuller got back to second over Boldway, Adrian Richard and Kai McCardy-Hirsch. Four speedway karts visited the Acres for the night to help add to the show. Sean Fuller was quick time in qualifying with an 11.385 qualifying lap. Lori Fuller won the trophy dash with Nick Davis claiming heat race honors. Lori Fuller led lap one of the 20 lap main event before giving way to Sean Fuller. It was pure dominance from that point on as Sean Fuller was able to cruise to the win by nearly eight seconds. Davis, Lori Fuller and Larry Fuller rounded out the field. The 250 and 500 karts were combined for the night with Sean Fuller setting a sub-10 second lap in qualifying with a 9.836. The night belonged to Brad Curtice who took the dash and heat race wins. Anissa Curtice led the first two laps of the 30-lap feature before her father, Brad took the lead. He was able to lead from that point to the checkered flag. Anissa Curtice and Fuller took second and third. Timmy Walters was the only driver under 10-seconds in the box stock class as he set a time of 9.510. Natalie Richard won the trophy dash while the heat races were taken by Malessa Miles and Brionna Fuller. The 25-lap main featured a fantastic duel for the lead between Fuller and Richard. Fuller led the opening 11 laps before Richard utilized lapped traffic to take the lead. Fuller regained the lead on lap seventeen but got tangled with lapped traffic with five laps remaining. This gave Richard the lead and she was able to hold on to take the win. Jeremiah Boldway crossed the line second with Quentin Ikeya third, Miles fourth and Fuller placing fifth. The 2016 schedule for Redwood Acres Raceway heats up this coming weekend. Friday June 24th the outlaw karts return to the dirt for a special fair night race. The following night, Saturday June 25th features a special Night Of Destruction. Both fair races are presented by DelReka Distributing with grandstand admission for the Friday event included with the price of fair admission. The late models will have the night off but the other five local classes will be in action. Feature events include a pole race for the roadrunners and the popular boat race which will cap off the night. Grandstands will open at 5:00 PM while racing begins at 6:30 PM. SACRAMENTO, CALIFORNIA (June 21, 2016) - The Pacific Challenge Series presented by PenneyLawyers.com will hit its halfway mark on Saturday night, with round six of the 2016 season at All American Speedway. 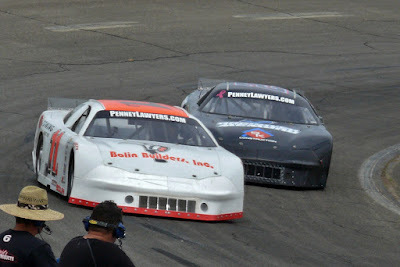 The "Return to Roseville" is the second of four appearances at the one-third mile asphalt oval. Race fans will be treated to a great night of action with the North State Modified Series and Pro 4 Modifieds joining PCS for the races that also take place during the Placer County Fair. Valley Springs' Tracy Bolin is on a streak of three straight top-fives including his first series win at Shasta to rank fourth in the standings. "I think we can go in (to Roseville) and win. (We) always do real well there...don't always have the best finishes this year," Bolin said. "We were close so many times but had some bad luck. So to finally get a win was great for these guys. I thought we gave one up at Stockton and should have had that one too." Jason Romero of Cameron Park, CA won PCS' first Roseville race this year back on April 16th. Romero is one of five different winners on the tour in 2016 along with four of the five events having new track records set in Sunoco Fuels qualifying. Manteca's Jacob Gomes won round one at Madera followed by Romero at Roseville, Jeremy Doss at his home track Ukiah Speedway in May, Roseville's Eric Schmidt in Stockton, and Bolin at Shasta. Doss, 19 of Upperlake, is the series' winnigest driver with 17 career victories. Although he has not dominated this year, the Kulwicki Driver Development Program member has been strong with top-threes in four of the five events this season along with a fifth at Roseville. His total resume at Roseville includes six wins and a perfect nine-for-nine top-tens in his career at the facility. "We're just going to try to keep finishing up front," Doss said. "Keep stacking these top fives and hopefully get some wins. Looking forward to going to Roseville. Its awesome to see and says something about the PCS with five winners in five races." Second in the standings is Tracy's Jeff Bischofberger who also happens to be Doss' teammate. He was unable to compete in Shasta and trails Doss by 66 points before throwaway races are factored in. Bischofberger started the season with three consecutive third place efforts before an eighth place at Stockton. JR Courage did not compete in the first Roseville race but recorded his second fifth place run of the year at Shasta to move up to fifth in the standings. Both Courage's brother and father were champions at Roseville, with Courage carrying high hopes for a strong run in the #37 Walker Motorsports entry. The balance of the top-ten includes Granite Bay's Cole Moore fresh off of his second career NASCAR K&N Pro Series, West start two weeks ago in Colorado. Loomis' Chris Scribner is also planning a return to his home track after missing Shasta due to damage sustained in a late race incident at Stockton. Eighth is Lodi's Matt Wendt who ran sixth at Shasta while Danny Malfatti of Hayward plans a series return after an absence at Shasta. 2015 PCS Champion John Moore rounds out the top-ten. Other regulars in the series this year have included Elk Grove's Mike Hite, Eagle, ID's Travis Milburn, and Upperlake's Jimmy Stillman. Redding's Jason Mitchell, 2015 PCS Roseville race winner Shannon Mansch, and Sacramento's Michael Roman are among other drivers expected on Saturday night. Friday practice will see the pits open at 2 p.m. with on track activity from 3 p.m. - 8 p.m. There will be no car fee, just a $35 pit pass fee. Saturday sees the pit gates open at noon with the first practices beginning at 2 p.m., qualifying at 5 p.m. and racing at 6 p.m.
Austin Herzog (center with 51Fifty hat) celebrates his third Jr. Late Model win. His father, Bryan is on the right. 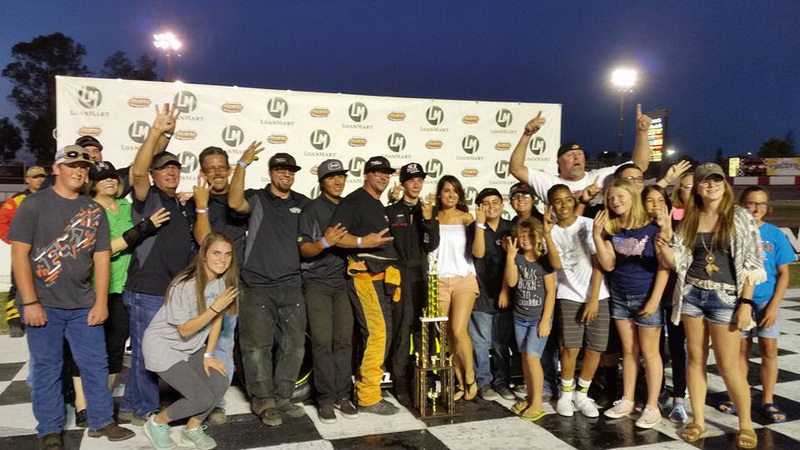 MADERA, CALIFORNIA (June 18, 2016) – Austin and Bryan Herzog achieved an unprecedented feat for Father's Day weekend, with the father and son duo each claiming Late Model victories in Saturday's MAVTV-televised action at Madera Speedway. Austin, 13, won an outstanding 51 Fifty Jr. Late Model race for his third win of the year. Bryan later won the 100 lap LoanMart Open Late Model for his first victory of the season. Austin's win was yet another come-from-behind victory in the 50 lap contest against a 15 car turnout. Herzog navigated through entire field in just 16 laps after a mid-race incident, and used a stunning turn four pass on the outside of Ryan Vargas on lap 48 for the win. Herzog's wins in the last two races have seen him lead just six total laps. Las Vegas' 12 year old Dezel West took quick time and led the field to green. Herzog kept West in sight throughout a series of early race caution periods. A strong battle developed between 11 year-olds Idaho's Zachary Telford and Jesse Burks for fifth. Burks dove inside Telford in turn one on lap 13 but spun to bring out the caution. Canadian Ben Silliker, also 11 years old, used the ensuing restart to overhaul Telford and bring Austin Edwards from Southern California with him. The pair then applied pressure on Las Vegas' Kyle Keller for fourth. West led Herzog,15 year-old Ryan Vargas, Silliker, and Keller into the halfway break at lap 25. After a five minute break for adjustments, the action continued with Edwards using the restart to get fifth from Keller. Edwards and Silliker showed great driving ability as they drove out of some sideways contact a few laps later. Edwards eventually slid to a halt in turn one to bring out a lap 33 caution. Slowing for the caution, West and Herzog made contact on the front stretch with West spinning. West blended back in for third place with Vargas assuming the lead over Silliker. Herzog was relegated to the rear. West turned up the wick to try to gain the lead back as he made contact with Silliker in turn four with Silliker spinning. Jarrett Gilmer sliced through the traffic to take over second on lap 39 while Herzog slowly chipped away at the leaders. Things escalated when West tagged Gilmer in turn one on lap 44, with Gilmer spinning. Kolby Berry assumed second and Herzog found himself third. Ali Gay had made her way to fifth but got tangled up on the restart in an incident that ended the race for April winner Austin Edwards. Herzog moved his way past Berry and put his sights on Vargas for the lead. On lap 48, Herzog jumped to the outside of Vargas in turn three. Vargas drifted wide in turn four with the pair making slight contact. Herzog raced past a sparking Vargas and never looked back for the victory. Vargas nursed a flat right front tire to ultimately finish eighth. Herzog led Berry, Silliker, RJ Smotherman, and Gilmer the top-five finishers across the stripe. Bryan Herzog's LoanMart Open Late Model 100 win avenged his narrow loss to points leader Matt Erickson in round #3 on May 28th. Herzog took over the lead on lap 15 and defended from countless challenges from Erickson down to the wire. Dos Palos' Ryan Hart led the opening ten laps of the race with Garland Tyler making his way forward to second place. The top eight cars ran side-by-side often in the early stages as the first half of the race was run under rare sunlight conditions. Hart picked the bottom line on a lap 10 restart and surrendered the lead to a hard-charging Tyler. Herzog moved past Hart as well. A lap 14 caution was all it took for Herzog to use the bottom to take the lead from Tyler. Dominic Lopez, fresh off of a career-best top-ten in round #3, went up in smoke with electric problems on lap 18. There were still 17 lead lap cars at that stage of the race. Hart and Glen Cook staged a furious battle for third position with the pair sliding down the backstretch sideways at one stage. The contact caused eventual mechanical problems for Hart that his team was able to repair under a later caution. Round #2 runner-up Ryan Philpott of Tracy dropped from contention with mechanical woes on a lap 23 caution for Del McIntosh's mechanical-caused spin in turn one. Philpott eventually rejoined the race several laps down. Erickson moved up to second position and battled closely with Herzog through several restarts. Rick Thompson and Alexander Mead had a grinding crash on lap 41 that ended Mead's evening. The first half was ended prematurely during a lap 48 caution. The second half of the race resumed several hours later under total darkness. Tracy's Justin Philpott picked up the pace to duel with Hart for fifth in a battle that would continue for much of the remaining laps. Erickson kept Herzog within a car length with the final 52 laps have abundant green flag racing. Erickson took many looks inside Herzog throughout lapped traffic with Tyler in the nose-to-tail trio. Contact between the leaders got the fans on their feet on lap 86 as they charged out of turn four. Herzog was able to drive away from Erickson as his door panels. Hart eventually spun in turn three on lap 86 in the midst of the great battle with Philpott for the race's final caution. Cook used that stoppage to wrestle third away from Tyler, but Tyler claimed it back on lap 98. Erickson tried a few slidejob attempts that fell short as Herzog rolled the top side. Herzog was credited with a .366 lead over Erickson under the double checkered flags with Tyler, Philpott, and Cook the top-five. Lucy Carmona won her first career Toyota Sedan race in one of the earlier main events of the evening. Carmona took over the lead from Thomas Magray on lap three and never relinquished it with Erik Woods second and points leader Jilliaun Holden in third. Magray eventually finished fourth. Carmona has aspirations to move into the Late Model division and has been doing extensive testing at the speedway leading up to a possible July debut. Rocklin's Robby Czub continued a perfect 2016 season in Legends cars, winning his sixth straight win state wide in the Legends of the Pacific-sanctioned action. The 35 lap race actually had four different leaders with John Bowman at the helm for the first four laps before Jack Wood took over. Wood was spun from the lead by Bakersfield's Braden Rogers on lap nine handing fellow Bakersfield driver Colton Page the lead. Page's lead only lasted a lap before Czub moved past him. Czub eventually gained more than five seconds on the field for the comfortable win. Page, Stockton winner Pete Peirce, Wood, and Kern County champion Eddie Garone were the top-five at the finish. Clovis' AJ Russell knocked off the dominate Bakersfield driver Justin Tuey for a popular win in the CSS 360 Super Modifieds. Russell has been one of the busiest drivers at Madera in open wheels, running both the Super Modifieds and the Madera Winged Super Sprints. Tuey led the first four circuits before surrendering to Russell. Russell's lead waned in the closing stages with Tuey closing to within 1.533 seconds at the stripe. Lance Jackson scored another top-three in third although he was one lap down on the leaders. Chuck Dozhier and Joseph Riechmuth resumed what has been a dogged battle for Super Hobby Stock supremacy at Madera in 2016. Saturday night belonged to Dozhier as he won the 40 lap race. The fast-paced feature was concluded in just 11 minutes as Dozhier's lead over Reichmuth ebbed and flowed through the race. The pair came nose-to-tail several times before Dozhier pulled away at the end for a .800 margin of victory. Eloy Bazan ran a steady race from third position ahead of Thomas Suarez and Jesus Hernandez. Modified Super Toyotas (MSTs) had a wild race that saw a very deserving win for John McCollum, Jr. McCollum was racing in honor his late grandfather George McCollum who recently passed away. Patrick Geiger led the first three laps before McCollum took over. Incoming points leader Kevin Thompson slowly but surely made his way towards the front and was to third by lap nine. An incident involving Thompson and Bert Stephens sent them back to the rear. McCollum was undeterred in a narrow .134 second win ahead of the late run by Thompson with Stephens in tow. Geiger settled for fourth over DJ Landers. The Loanmart Madera Speedway is off on June 25th before returning to racing on July 2nd for the Grassroots Racer Classic with a giant fireworks show! MAVTV coverage of Madera Speedway continues on Thursday June 23rd with another original episode of "Madera Racing" Thursday's broadcast features the April 30th race for the 51FIFTY Jr. Late Models and the March 19th 75 lap race for the Pacific Challenge Series Super Late Models. "Madera Racing" airs Thrusdays on MAVTV at 8 p.m. Eastern / 5 p.m. Pacific.